Shimano's SM-RT81 Ice-Tech Disc Rotors feature a unique 3-layer construction that allows them to operate up to 220 degrees (F) cooler than standard steel rotors. They're built with aluminum core and two stainless steel outer layers to lower the operating temperature, resist power fade and increase pad life. Optimized for Ice-Tech brake pads. Shimano Center Lock compatible. Available in 160mm and 180mm sizes. Actual weight: 123g (160mm, hardware included). Sold individually. We are using the 203 mm rotors on a tandem. They are flat, and have not been drilled out too much. Some other rotors that we have tried do not have enough breaking surface. Bought this to mount o new Reynold's Assault Disc wheels. Un-matched stopping during rainy Oregon days. Easy to install and worked perfectly when installed. Great service and price. 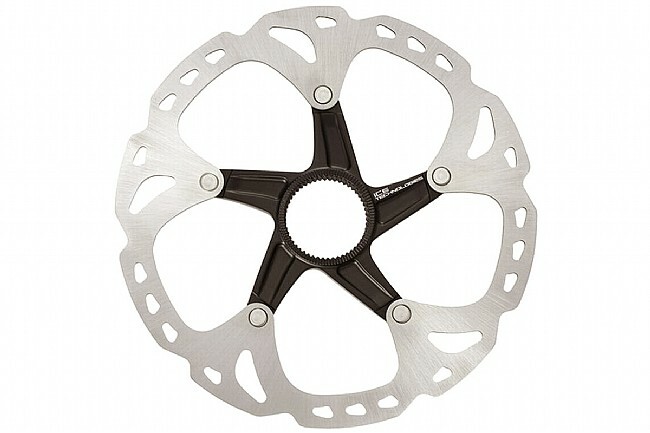 As is true for other XT components, this rotor defines the intersection of superior performance at a reasonable cost. Excellent stopping power in all conditions. The only caveat is that one must be careful when truing these rotors - they can be irrevocably damaged if bent too far. I switched from a stock rotor and am glad I did. Whereas my previous rotors were noisy and seemed to heat quickly, the Shimano XTs function perfectly. They look pro, too. Thanks to WBW for the suggestion. I definitely recommend. Great product, fair price, and quickly delivered. For daily use and for high-mileage randonneuring, these rotors deliver confident stopping power on demand. Paired with semi-metallic pads for all-weather predictability. Would replace with same when worn out. I replaced my stock TRP rotors with these, and despite the (slight) weight penalty, they stay true and have incredible stopping power. I'm sticking with Ice Tech and not looking back. Got it on time at a good price. Went on easily, nice to use the same tool as a cassette. Stops the bike! I don't have any basis to compare it to another rotor, though. The XT disc brake is just a great overall brake for the price and weight. I never had a problem with the disc keeping it's form. I was excited to mount these rotors, until I noticed the spider and rivets are too long and interfere with the brake pad levers on BB-7 road brakes. I tried respacing the calipers with some washers, but not enough of the rotor brake surface was exposed. I bought some cheaper CenterLock rotors that don't have the same length spiders, and they work fine with Avid BB-7 road calipers. Too bad - these are really well made, and I'll sell them on Ebay second-hand as they are used and cannot be returned. I love these discs. I replaced the Stock Tektros on my Trek FXS6. I put Shimano resin pads on too. I'll be further upgrading to Shimano XT calipers and levers. It'll be a sweet set up! . There are well made, easy to install, and are the rotors which Shimano says are the only ones that should be used with their Ice Tech brake set. They are well made and quiet.